Big Fat Papa’z is a blues band from France that has a distinctive style, energy, and a unique mingling of blues with soul and 70’s rock. The band is: Hugo Modena on drums, Damien Richard on vocals and guitar, Quentin Crenes on bass and Nile Kirchner on guitar. 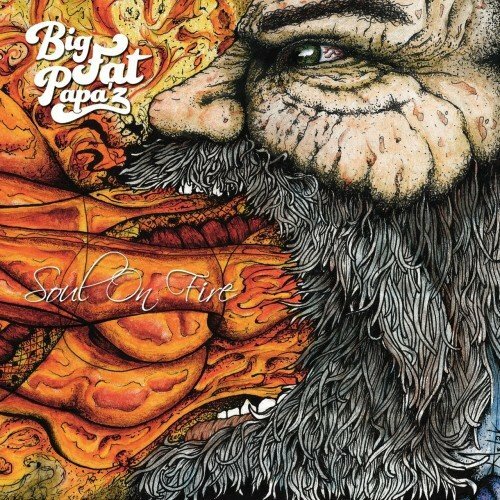 Big Fat Papa’z set of high-flying tracks is called, Soul on Fire. With a vast arsenal of diverse styles drenched in the blues, the band has a punchy blues sound that will get your blood pumpin’. Richard has a powerful lead voice and the guitar work is first-rate. The band ultimately straddles the line between wild blues and controlled rock, either way you hear it, they know how to convey their music with passion and the music is an exciting sounding heavy blues! That’s the short of it! The album will bath your ears with powerful vocals, blues infused guitar solos and hip riffs and hooks. This is a nice mix of blues-n-rock, every song has this combination, creating a musical palette of their innovative heavy blues. Soul on Fire is an excellent album of heavy blues. Richard’s raspy vocals are strong and convey energy. The songwriting is certainly one of their many strong points, with multiple sections and melodies that stick with you all day long. The dual guitar work is enjoyable to listen to, this band will appeal to blues and rock fans alike. Marseille, a port city in southern France, has been a crossroads of immigration and trade since its founding by the Greeks, circa 600 B.C., Marseille is producing a hard-hit blues band and just maybe there is a new crossroads there too.